after which they declined. Riding (2006a) combined stromatolite diversity data (FIG. 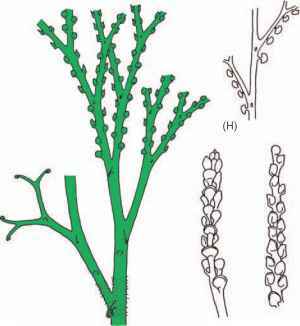 2.35) (Awramik and Sprinkle, 1999) with data on the abundance of reefal microbial carbonates (Kiessling, 2002) and metazoan diversity (Sepkoski, 1997). He found that stromatolites increased in abundance until —2250 Ma, remained at that level until ~ 1450 Ma, and then markedly increased in abundance until —1350Ma. After —1100Ma, they began an irregular decline until —550 Ma, the latest Ediacaran. Stromatolites and other microbial carbonates showed an increase in the Cambrian and Early Ordovician (Riding, 2006a, b), and there is little to no correlation with marine metazoan diversity during the Phanerozoic, suggesting that metazoan grazing was not the primary reason for Proterozoic stromatolite decline. If the rise of grazing metazoans is not the primary cause of stromatolite decline, what is? Competitive exclusion by eukaryotic algae has also been implicated. Butterfield (2001) suggested competitive exclusion to explain the monotypic Bangiomorpha community in the Mesoproterozoic Hunting Formation (see above). Andres and Reid (2006) studied modern stromatolites in Highborne Cay, the Bahamas, and found that stromatolites persist in areas where sediment influx is high, because metazoans and macroalgae are excluded. 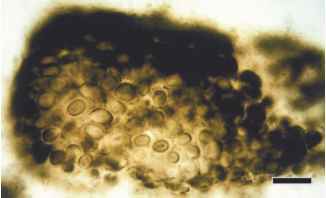 If sedimentation patterns change, both metazoan borers and macroalgae colonize the substrate, outcompeting and eventually excluding the microbial stromatolites. Climate change in the Proterozoic, including two major glaciations, is also hypothesized to have contributed to stromatolite decline. Riding's (2006a) analysis showed that the decline itself is more complex than previously thought and cannot be explained by metazoan grazing alone. Further fossil studies are clearly needed, especially on substrates and modes of growth of stromatolites, if we are to fully understand this important Proterozoic event. 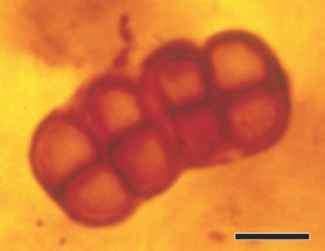 changes in the cyanobacteria appear to have been established by the Neoarchean-Paleoproterozoic (Knoll, 1985b). The same cannot be said for the eukaryotes, however. Eukaryotic diversity, as measured by morphotaxa of acri-tarchs, especially large complex acritarchs (FIGS. 2.39, 4.75) underwent a number of changes in the Neoproterozoic. These planktonic microfossils show a gradually increasing morphologic diversity beginning in the Mesoproterozoic and extending into the mid-Neoproterozoic (—1200-700 Ma) (Knoll, 1994; Porter, 2004) (FIG. 2.39), followed by a decline around the time of the Sturtian glaciation (— 750700 Ma). Toward the end of the Marinoan glaciation (—625 Ma), acritarchs exhibit a rapid increase in diversity (Zang and Walter, 1989) followed by a major extinction in the latest Neoproterozoic (Vidal and Knoll, 1982; Porter, 2004). Acritarchs again underwent a diversification event in the Early Cambrian concomitant with the radiation of shelly animals. A very diverse assemblage of acritarchs in the Pertatataka Formation of central Australia (650-600 Ma) includes about 25 genera of complex acritarchs, much larger than those found in younger rocks (Zang and Walter, 1989). The lower part of the formation contains simple spheroidal acritarchs, whereas the upper part contains as many as 40 taxa of acri-tarchs, including many spheroidal forms, but also large, ornamented types. 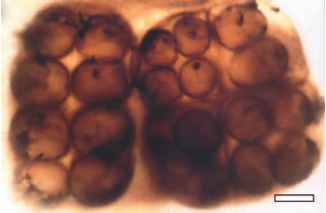 The most abundant taxon in the upper assemblage is Cymatiosphaeroides, which is — 180 pm in diameter and characterized by numerous thin spines on the main vesicle. Zang and Walter compared these forms to younger microfossils, but noted that this assemblage is unique. Up to half of the assemblage (10-15 genera) occur only in this formation; a third represent taxa previously known from other Proterozoic assemblages, and only a few taxa are closely related to Paleozoic forms (Knoll and Butterfield, 1989). Perhaps most interesting is that these forms with Paleozoic affinities are consistently two to three times larger than their younger relatives. Zang and Walter suggested that this type of assemblage had not previously been recognized in the Ediacaran because it represents an environmental setting (offshore marine) that is poorly represented in rocks of this age. Extinction of these forms occurred in the latest Neoproterozoic.